For 16 years I had carried some 30+ kilos excess weight and had done the usual diet merry-go-round with little success. A chance meeting with Peter Edwards was to change that almost instantly. My husband, John was having a consultation with Peter and I sat in as well. By the time our 30 minutes was up, I had begun to feel that Peter had a special gift with the work he is doing. After the consultation, as we waited to collect some supplements, Peter continued his advice on his nutrition program. Then, turning to me, Peter said, ‘You follow it too and you will lose weight.” I did not answer this comment as words evaded me. My thoughts were:- Who does he think he is and how does he know I want to lose weight anyway, how rude is this person. We left Peter’s clinic and I was quite annoyed with his very pointed remark. I kept my thoughts to myself and did not say anything to John about it. However, I started to think on my initial sighting of Peter, and it was like wow! I would like to look like that too – he looks so good, there is a special appeal about this person. And, of course, I knew what Peter said was true – I certainly was overweight. We went home, and I prepared the suggested menu for both of us. We have continued to follow Peter’s advice and to date I have lost 20 kilos over a period of seven months. Well, this had been the turning point for me. Peter had opened my mind to a better, healthier and uncomplicated lifestyle. No one had been able to do this during the past 16 years. Peter, you practise what you preach – your appearance says it all. You impressed me greatly and you have been my inspiration. New found Health – I have lost 31 kilos. Having dropped three dress sizes! (A second letter from Dorothy two years later). Two years ago I was living in a rut, distressed and depressed. For 16 years I had a constant battle with overeating and the more stressed I became, the more I ate and the more I ate, the more depressed I became so much so that it was putting my family and marriage under stress. Whilst I always had an interest in health and natural foods, it was not until I met Peter Edwards that I was motivated to do something and claw my way out of the rut. Peter is a fine example of a healthy lifestyle and I was determined to have the same vibrant vitality as he portrayed. Peter devised me a detoxification program for me and after being on it for a week I felt so well, I had no intention of turning back to my old ways of eating. Even my taste buds were working better. My health has improved dramatically and a result, I have lost 31 kilos. Having dropped three dress sizes, it is now wonderful to go shopping and know I can fit into fashionable and trendy styles. Recently, my husband and I visited our daughter. We had not seen her for several months. My image was so different, she momentarily did not recognise me on arrival at the airport. I have received numerous complements from friends and acquaintances. They want to know my secret. I have happily recommended Peter’s lifestyle plan to them. Supermarket shopping is so different now. Having virtually eliminated meat, dairy, sugar and processed foods from our grocery list, the tally at the checkout is about half of what is used to be. I sometimes feel tempted to approach all those people loading their shopping trollies with soft drink, potato chips and all manner of junk food, to tell them there is a better way. We have abundance of fresh, nutritious, natural food in this country and we do not need to turn to those highly processed foods marketed for profit only. While we follow a healthy diet at home, we would never embarrass a host by not eating what they have prepared. It is good to break out, once in a while, and enjoy another person’s cooking. To be happy and healthy has always been my aim in life. I am indebted to Peter for showing me how to achieve this. My advice to people is “do not mess with your health, it is your greatest asset”. I found a healthy lifestyle and a controlled appetite is so easy to follow. The rewards are immeasurable and for me, weight loss was a resultant bonus. Thank you Peter for being my inspiration. 28.6 kg lighter, no headaches, full of energy, feeling and looking younger. I’m a new woman thanks to Peter. I first went to Peter on the 2nd of December. I am 67 years old, the mother of seven including a 32- year-old handicapped son. I was overweight, run down, tired, couldn’t sleep, cranky, no energy, migraine headaches. I was just getting over a serious knee operation. Now 12 months later and four and a half stone (28.6 kg) lighter, no headaches, full of energy, feeling and looking younger. I’m a new woman thanks to Peter. I have followed his diet and will always do so as I know now what it is like to be alive and well. Thank you Peter for my new lease of life. Results can be seen and felt fast. A million dollar week! Just loved the personal touch, your kindness, your patience with all my questions and your beautiful selves. Just loved the one on one learning and writing out the ‘Plan for Action” for when I get home is of paramount importance for me. Just love the 5kg weight loss, the views, the sunrises and sunsets, the music, the everything. And best of all – I’m looking forward to looking like a ‘Million Bucks’ in the very near future. I’d like to share a brief story about my daughter. Amanda came to live with her brother and I in a busy bachelor’s pad! 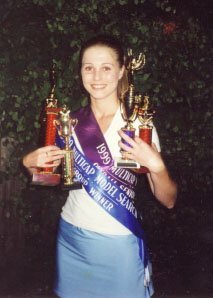 The first photo shows Amanda just before she came, at 13 years of age. She was by no means obese but she had been putting on weight to the extent I was getting concerned but, because of the situation, couldn’t say or do any more about it. 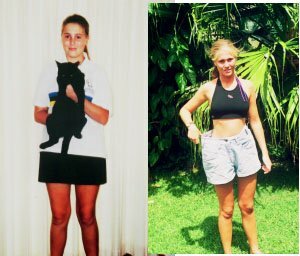 When Amanda settled into this naturally active and healthy household, she was eager to also, ‘get her body into shape’! I didn’t have to do any pushing, I just supplied gentle encouragement and the information needed. Amanda also started working with me as my receptionist on Saturday mornings and this was a very positive source of motivation. She saw many people’s lives changing for the better through changing their lifestyles, diets and generally following my advice. Yes, dads can be right sometimes it seems. She asked me to help her get in shape so I booked her in for an ‘official consultation’ and we got down to business. I went over her diet and lifestyle as I do with all my patients and she left with a clear and specific plan. A plan to change her life and she was highly motivated. We recorded her weight each week. She began at 65 kg and progressively lost weight each week. By January 18, she was down to 54 kg. She had lost 11 kg in just four months. At this stage I suggested she even out here at this weight, which she did effortlessly. The photos show Amanda almost six months later. As well as losing the weight, she was feeling great for the changes she had made and I must add, looking great too! My fatherly instincts were kindled as I was noticing young men (some not so young!) seemingly eyeing her off like vultures circling their prey whenever we were out together. Amanda at 65 kilograms and after losing 11 kilograms. So we had another success story and this time it was under our own roof. We were all pleased and, of course, proud of her efforts too. I would like to add here that Amanda accomplished this trans- formation without any fanatical dieting! She did, however, get interested in improving her health and appearance by following a healthy feeding program just like the one I have outlined in this book and also in more detail in our book, Glow With Health. Importantly, Amanda became more active and exercised regularly. Her attitude was positive, her food was now positive, her activity was positive and her results couldn’t be anything else but the same, positive! Amanda was given the information on how she could help herself and she did it for herself. Once again, give the body the right chance (conditions and opportunity) and it does the rest beautifully. The key to achieving lasting results is not just changing your diet. It is making liveable changes to your lifestyle. Amanda went on to become a successful model, Personal Trainer and now travelling the world and enjoying a great life and lifestyle. Good health, vitality and beauty are gifts of Nature for those who live according to her laws.